This well-preserved dovecot – or doocot – was built in the late 18th century. It is one of the most accessible in the Highlands, situated directly next to the road in Culloden, at a bus stop! 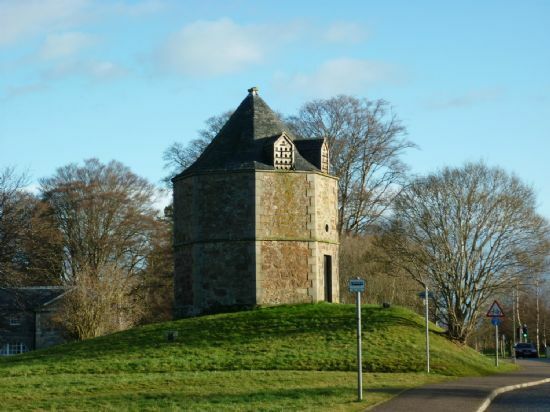 Octagonal in shape with a slate roof, the doocot contains over 600 nesting boxes within the building. Within the building was also a rotating ladder - a potence - used to collect the eggs. The plinth and tree survive, but not the ladder itself. Doocots in Scotland date back to medieval times, although the earliest surviving ones are from the 16th century. Before cattle could be overwintered, the doves or pigeons housed in the doocots provided the major source of meat for the winter, as well as eggs. They also provided fertiliser for fields. Their use was resented by tenants and other nearby farms, because of course the pigeons did not just eat their owner’s grain. Only landowners possessing a minimum amount of land were permitted by law to build doocots on their estates, perhaps in part to try and ensure the birds primarily ate landowner’s grain. Two main types of doocots are found, one free-standing and generally bee-hive shaped, the other a lectern-style, sometimes placed against another building. Many doocots, including this one, have a rat course extending around the outside to deter rats from climbing up and stealing eggs. 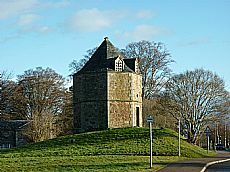 On some farms, particularly the later ones, the doocot was an excuse for architectural experimentation and farm ornamentation. ARCH is running a course on Discovering Culloden’s Heritage – Inside and Out for the Workers’ Educational Association (WEA) in March 2011. Contact the WEA office 01463 710577 for details if you would like to find out more about Culloden's heritage. N.A. Brown 2004. Doocots of Scotland: Moray. Nick Brown 2005. Foo’s yer doos – aye pickin?